A few days earlier, I had fulfilled a lifelong dream to climb Mount Kilimanjaro, Africa’s tallest mountain. I climbed to the roof of Africa with four friends, one of whom is blind. 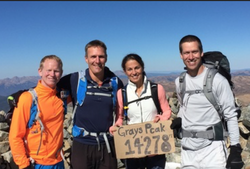 Together we summited in the fastest amount of time possible to set a record for an athlete who is blind (we did it in 2 ½ days) and we trekked at night to simulate, even in the smallest way, what it’s like to live in darkness. Climbing Kilimanjaro already had inherent value. We could go home and share our story with our kids, friends and family for the rest of our lives. But our intention was to use our experience for something greater than ourselves; how could we share the idea that anything is possible with children who desperately need hope and might blossom under the weight of that message? If my friend Dan couldn’t see and yet climbed it anyway, wasn’t there a message in there for all of us? On the descent down the mountain through what felt like moon sand, I was dreaming about the schools we would visit in the days after our return to Moshi. Before leaving for our trip, I had googled schools for children who are blind, programs that support street children and impoverished schools that might want to share in our messages of hope. Within a few months, I had virtually connected with three principals/directors (two in Tanzania and one in Kenya) and after doing some research, holding several Skype calls and assessing what each situation entailed, we planned three events where we could share Dan’s accomplishment and inspire the children. When you are immersed in the developing world, every word matters. Every dollar counts. You quickly realize that the stuff we surround ourselves with is sometimes just noise crowding out the true connection of the human spirit and the simplest way to be. ​Three months ago, I sat at a UNICEF Peru event at the Luis Braille School for the Blind in one of the poorest sections of Lima, Peru, and began to absorb what we had just accomplished. I watched Dan Berlin speak to a group of blind children, inspiring them with words that seemed to be opening up their young minds to all that might be possible. Charles Scott, Brad Graff and I sat there in awe of Dan as he spoke, absorbing success in the mission we had just accomplished. 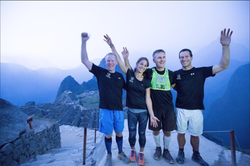 We set a goal last October 2015 to complete the Inca Trail to Machu Picchu in one day, and we made history as Dan became the first blind athlete to complete such a feat. But the four of us also went to Peru with a much deeper goal - the hope to inspire others to go beyond their perceived limitations. We raised money for the Blind Institute of Technology and UNICEF Peru, but after speaking at the event and playing soccer with the blind children, Dan immediately suggested a portion of UNICEF’s money go directly to Luis Braille School. This week we received photos from our friends in Lima. 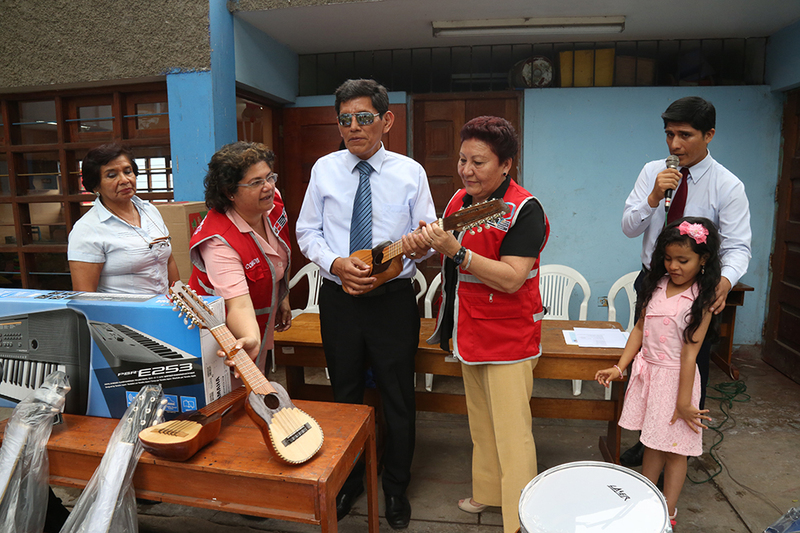 With the funds, the Luis Braille School purchased brand new musical instruments, something the school lacked. How could we know going into our physical endurance challenge that the result would be this? 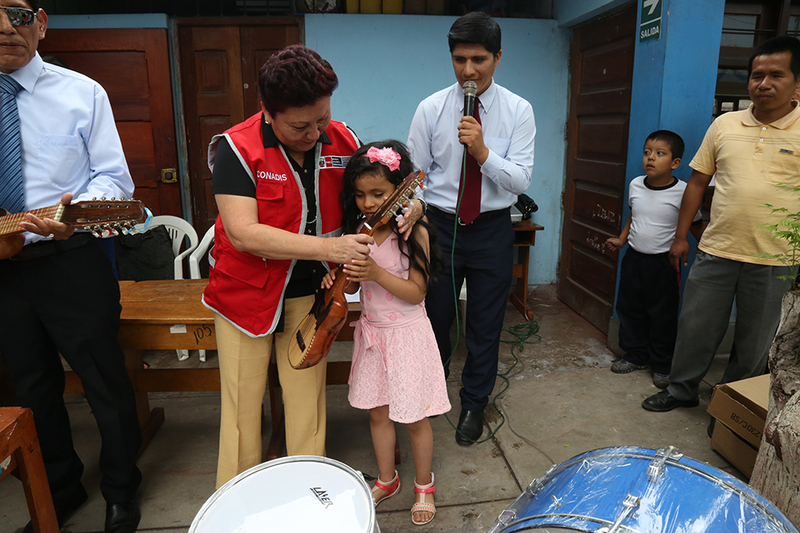 Thanks to our supporters and to UNICEF Peru, children who did not have access to musical instruments can now take music lessons at school. Particularly for a child who cannot see, imagine what they will now hear as the sweet sounds of music penetrate the hallways of the Luis Braille School. 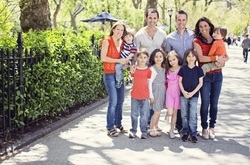 Alison Berna is a working mom based in New York City. She is the co-founder of AppleSeeds Play, an all in one play space for families with children newborn to five. 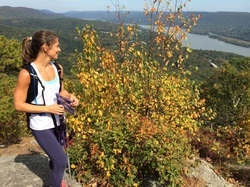 An avid runner, dedicated Yogi and newly minted adventurer, Alison recently joined a team of five other runners (and the only woman) to help guide the first blind athlete, Dan Berlin to complete the Grand Canyon Rim to Rim to Rim trail run--consisting of 46 miles, 25,000 feet of climbing over 28 hours. Their effort was to help raise money and awareness for Blind Institute of Technology and Foundation Fighting Blindness. 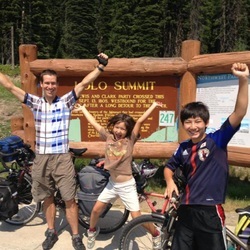 In her interview, Alison shares the challenges of being a working mom, how she became a budding entrepreneur from her days working at NBC and UNICEF and how her passion to help others achieve their goals has given her a second wind to live a more meaning and inspiring life..
​Charles is the author of Rising Son: A Father and Son’s Bike Adventure across Japan. 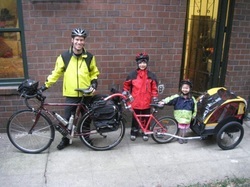 The United Nations named Scott a “Climate Hero,” and Red Tricycle named him “One of NYC’s Coolest Dads.” Charles has biked over 7,000 miles with his young children across Japan, Iceland, Europe and the U.S., and has been featured in media around the world. 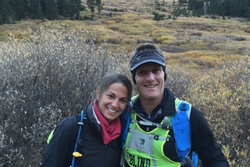 He also guides blind athletes in endurance events and is preparing to lead a blind athlete on a single-day, 46-mile run across the Grand Canyon. Prior to founding the Family Adventure Guy, Charles worked at Intel Corporation for 14 years. 1. How are you doing what you love? 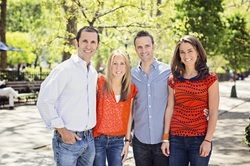 About eight years ago, I started a business in New York City called apple seeds with my husband Bobby Berna, and my close friends Allison and Craig Schlanger. 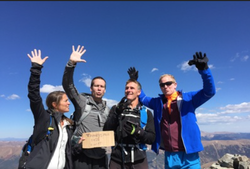 Celebrating my first two 14,00 foot climbs with my friend, blind athlete, Dan Berlin and our teammates Charles Scott and Brad Graff. Grays and Torreys Peaks were also Dan's first two Colorado 14ers and they were the most complicated trails we have yet to guide him on, given the treacherous Rocky Mountain terrain. There was no solid ground to receive Dan's guiding stick as we passed over rock after rock into thinner and thinner air. Yet Dan climbed and climbed, trusting the three of us. As I stood at both summits, I was in awe of Dan's ability to overcome his disability and climb these two mountains anyway. It really is the message of our team, Team See Possibilities...it's about removing the obstacles in your path (in your mind?) and focusing on what you CAN do, rather than what you can't do. 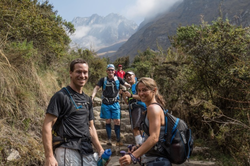 Giant thanks to our team's sponsors Intrepid Travel, Altra Running and UNICEF Peru! ​TAll good things must come to an end. Saya and I have officially finished our cycling trip from Tokyo to Kyoto and back. I always feel a little down when a big adventure comes to an end, but the sadness is quickly replaced by many good memories and the excitement of knowing that we will come up with more challenges to share in the future. On Monday, July 25, I will give a 90-minute presentation to the management team and employees at Intel Corporation in Tokyo. I'll talk about ways to use discomfort to your advantage, the power of informed risk taking, and the secret to optimal performance. 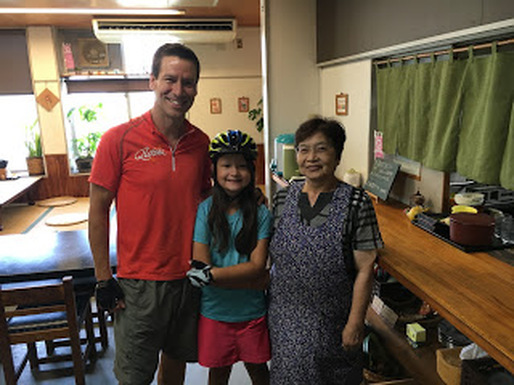 All these were top of mind as my 9-year-old daughter and I cycled over mountains and through Japan's summer heat in the past two weeks. Whenever the trip felt overwhelming, Saya and I laughed and said, "The harder things are, the more interesting stories we'll have to tell afterward!" Yesterday, I attended a memorial service in Tokyo for my father-in-law, who died a year ago at age 86. The Buddhist priest who presided over the ceremony said that it's natural to feel sad and lonely after someone we love dies. But their death is also a reminder of how precious each moment is. Each of us can craft a meaningful life full of gratitude for our short time on this little blue ball falling around the sun. My father-in-law experienced so much in his life: World War II, working in the U.S. and Europe, raising a family, losing his wife to cancer. As I looked at the many people who attended the memorial, I realized how much energy he put into building and treasuring connections with people throughout his long life. He understood that humans are designed to connect with one another, that we need support and love, and that we always have the opportunity to grow and change and help one another along the way. I miss him.